Following on from the recent launch of the new Raspberry Pi 3 mini PC to be added to the ever-growing range of mini PCs available in the Pi range last week. Adafruit has this week announced the availability of a new Raspberry Pi 3 Model B Starter Pack which includes everything you need to get up and running with your new Raspberry Pi pocket PC straight from the box. 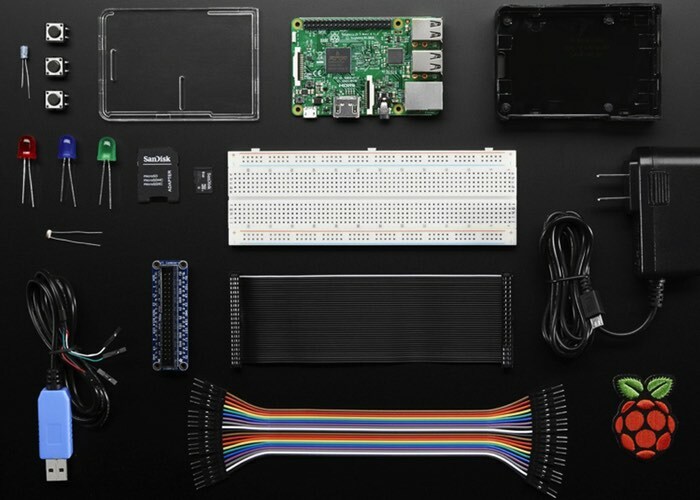 The Raspberry Pi 3 starter kit is now available to purchase priced at $99.95 directly from the Adafruit online store, which can be accessed via the link below. Adafruit explains a little more about the pack and its contents. We’ve hand chosen these accessories as the perfect accompaniment to your new Raspberry Pi 3 – Model B. It’s everything you need to get going with a high quality power supply, Raspbian 8G NOOBs SD card (newly updated to work on the Pi 3), lovely case, handy console cable, and lots of prototyping essentials. It’s a great jumping off point for the rest of our extensive accessory and pack collection. – Premium Male/Male Jumper Wires.